One of four official bottlings of this Speyside whisky that were launched in 2014. 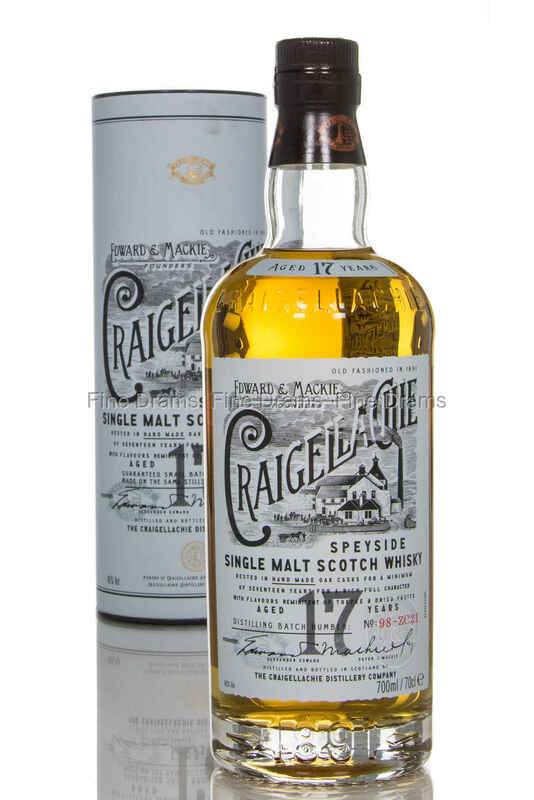 For many years, distillery bottlings have been something of a rarity, so it is great to welcome Craigellachie back into the fold. Historically a vital part of the Dewar’s blends, Craigellachie is distinguished by being one of a handful of distilleries that continue to use worm tubs. These large tubes are filled with a constant flow of cold water, and are an old fashioned way of quickly condensing the whisky vapours back into liquid. It has been said that these produce the meaty quality for which Craigellachie is known. This 17 year old has a fantastic level of maturity, after aging in American oak casks, that really shows of the quality of this distillery’s spirit. A dense and chewy mouthfeel greets the drinker, accompanied by notes of apples and dried fruits, wax, warm malt, a little barrel char, some tropical fruit and slight barbequed meat, alongside some woodspice. The feel of this whisky, particularly, benefits from it being bottled at 46% ABV and without chill filtration. An impressive return from this distillery, which offers a slightly different take on the Speyside character. Nose: Quite floral, but with lemon icing and sugar syrup too. Slight sourness, some orange peel and cinnamon. Good malt character with caramelised apple and pear. French vanilla after a while. Palate: Very buttery delivery, nice oak char, with some pepper, slight salt, followed by a rush of vanilla, pineapple syrup, with slight mango and peach. Again the caramelised apple. Cinnamon comes through after a while. Finish: Citrus from the nose returns, lemon cake and orange peel. Quite strong spice. Medium length. Overall: An excellent whisky, easily a 90/100 dram. Powerful but subtle, with interesting almost tiki notes on the palate.